The Virginia Department of Game and Inland Fisheries (DGIF) announced that Senior Officer Gregory Hall has been named 2017 Conservation Police Officer of the Year. 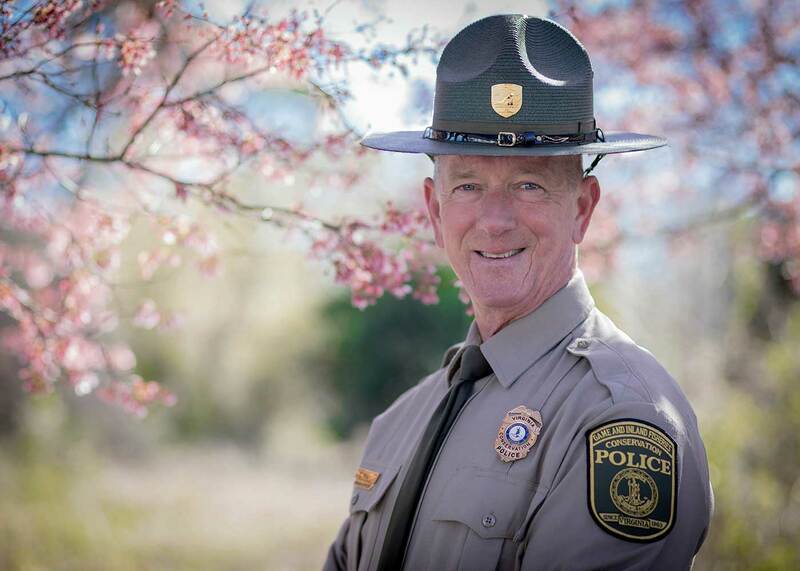 Senior Officer Hall’s steadfast leadership, his dedication to Conserving and Protecting Virginia’s wildlife resources, and his outstanding efforts in connecting the citizens of the Commonwealth to the outdoors through educational outreach made him the top candidate for this award. “I am proud of all of our officers, but especially proud of the outstanding work Senior Officer Hall has done to be selected for this prestigious award. He was part of an extraordinary group of nominees that we are privileged to have working for us and for the citizens of the Commonwealth. They are each to be congratulated on being chosen to represent their respective regions in the Officer of the Year selection process.” DGIF Executive Director, Bob Duncan. Throughout his career, Senior Officer Greg Hall has taken on a leadership role within his district and has proven to be the epitome of a field officer that spends countless hours patrolling the fields, forests and waterways of the Middle Peninsula looking for violations and protecting Virginia’s hunters, anglers, outdoor enthusiasts, and boaters. He has proven to be a highly accomplished investigator and conducted numerous complex wildlife and boating related investigations in 2017. One particular self-initiated case that Senior Officer Hall investigated was based on an abandoned personal watercraft that led to the identification of a large ring of criminal activity that involved multiple misdemeanor and felony violations in Virginia and North Carolina. To date, multiple suspects have been charged, convicted and sentenced to jail. “Greg is highly regarded in his assigned county of King William and the other counties within the district he works. His steadfast work ethic and amicable personality serve as an example to his fellow officers and are the basis for his reputation as an unwavering and fair conservation officer.” Major Scott Naff, Virginia Conservation Police Assistant Chief of Operations. Senior Officer Hall is a veteran officer with 20 years of dedicated service with DGIF. He serves the DGIF Law Enforcement Division as a field-training officer, a defensive tactics instructor and a background investigator. He graduated from St. Leo University of Florida in 2000 with a Bachelors of Business Administration. In addition to his service as a conservation police officer, Senior Officer Hall spent over 30 years as a distinguished member of the U.S. Army National Guard and retired in 2012 at the rank of Major. During his impressive military career, Senior Officer Hall honorably served his Country overseas in Afghanistan and the former state of Yugoslavia.